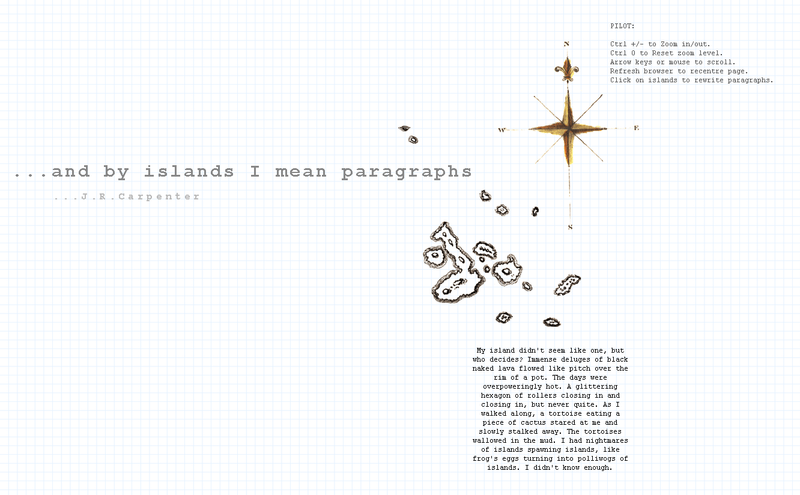 "...and by islands I mean paragraphs" casts a reader adrift on a sea of white space extending far beyond the horizon of the browser window, to the north, south, east and west. 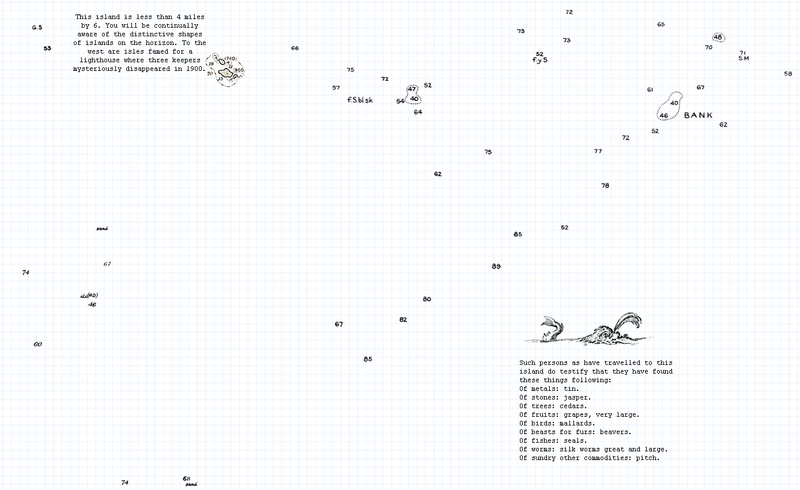 Navigating (with mouse, track pad, or arrow keys) reveals that this sea is dotted with islands... and by islands I mean paragraphs. These paragraphs are computer-generated. Their fluid compositions draw upon variable strings containing fragments of text harvested from a larger literary corpus - Deluze's Desert Islands, Shakespeare’s The Tempest, Defoe’s Robinson Crusoe, Bishop's Crusoe in England, Coetzee's Foe, Ballard's Concrete Island, Hakluyt's Voyages and Discoveries, and lesser-known sources, including an out-of-date guidebook to the Scottish Isles and an amalgam of accounts of the classical and possibly fictional island of Thule. "Individually, each of these textual islands is a topic – from the Greek topos, meaning place. Collectively they constitute a topographical map of a sustained practice of reading and re-reading and writing and re-writing islands. In this constantly shifting sea of variable texts one never finds the same islands twice... and by islands, I do mean paragraphs." Islands are a perfect topic. Topical islands come forward only under the condition that one is thoroughly lost. They are paragraphs. They show that insularity is a formal determination. Isolated writing is always without grammar or dictionary. The castaway constantly invokes the reader. The island upon which I was cast away was a great rocky hill with a flat top. I thought I was to spend the rest of my days there. I might just as easily have been cast away on an island home of some foreign adventurer gone mad with solitude. An island without seed. I was carried by waves. I pursue with my own dull story. They say Britain is an island too, a great island. In every story there is a silence. Was it effrontery to say that? Questions echo in my head without answer. The world is full of islands. I am saved. The island pointed towards the west and the decling sun. The forgotten traffic forced on relentlessly. Plunging through the grass. For the first time since the crash, clear of mind. Ten thousand pounds. You'll be able to buy the island. The grass festered over the ground.